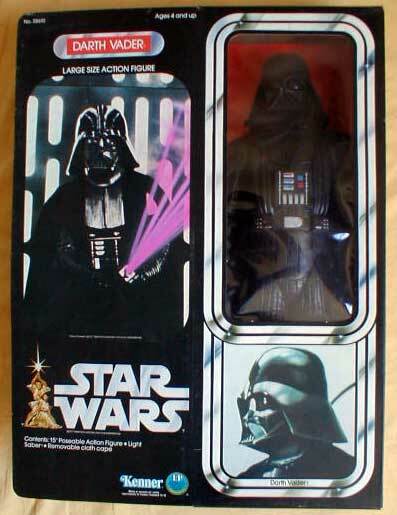 The villainous DARTH VADER in a dramatic 15" articulated action figure. He carries his special LIGHT SABER, ready for an attack by BEN (OBI-WAN) KENOBI or LUKE SKYWALKER. Authentically detailed black armor and removable cape. Ages 5 and up. 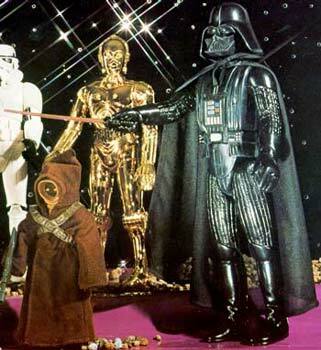 You had to like the Darth Vader large size action figure. It wasn't really one of the more interesting pieces in the line, and it certainly didn't blow you away with its accessories; but the detailing was pretty decent, and it just looked so cool posed on a shelf! In particular, I think Kenner did a decent job on the helmet. Rather than skimp on it as Hasbro did with their first 12" version of the figure, Kenner actually made it in two pieces, which they then combined for a truly accurate interpretation of the Dark Lord's headgear. So while the feel of the vintage figure's hollow, blow-molded body parts may have been a little wimpy, it's appearance was suitably impressive. Accessory wise, the figure came with a cape and a red lightsaber. It should be mentioned that the saber is a good deal different than those packaged with the Luke and Ben Kenobi large size figures. Specifically, it is much longer and its handle is of an entirely different design. 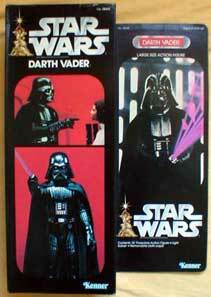 Vader is among the few large size figures believed by some to have been commercially issued in an Empire Strikes Back box. It may well have been, albeit in very small numbers. Loose, the figure is common, though it is frequently missing its accessories.